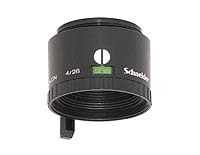 Schneider Componon 28mm enlarging lens for negative formats smaller than 35mm, such as ½-frame 35mm, 110 Instamatic, and Minox. The lens features an f/4.0 maximum aperture, click stops on each half-stop, and a full compliment of convenience features. Made in Germany by Schneider - Kreuznach.